Black Bros. has engineered Hot Melt Roll Coaters for many demanding applications, in widths up to 128″. The 116″ unit to the right was installed into a Recreational Vehicle (RV) manufacturing operation. The C1175 comes in standard nominal length widths of 74”, 86”, 98”, 110”, 122” & 128”, but can be customized to fit your needs. Black Bros. has engineered the C1175 hot melt roll coater with 11-3/4” diameter silicone covered coating rolls and 10-1/2” diameter chrome doctor rolls made with heavy wall steel tubing to reduce deflection. Oil heat transfer units with positive displacement pumps are mounted on a common frame for fast, efficient & consistent heat. 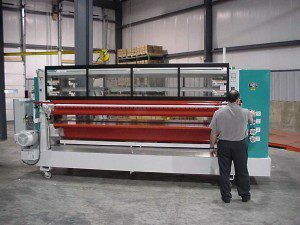 One or both rolls can be heated with hot oil circulation through one “counter-flow” rotary joint per roll. Tempered glass shields with aluminum frames and air lift with electrical interlocks help keep operators safe, plus contain fumes for better exhaust. 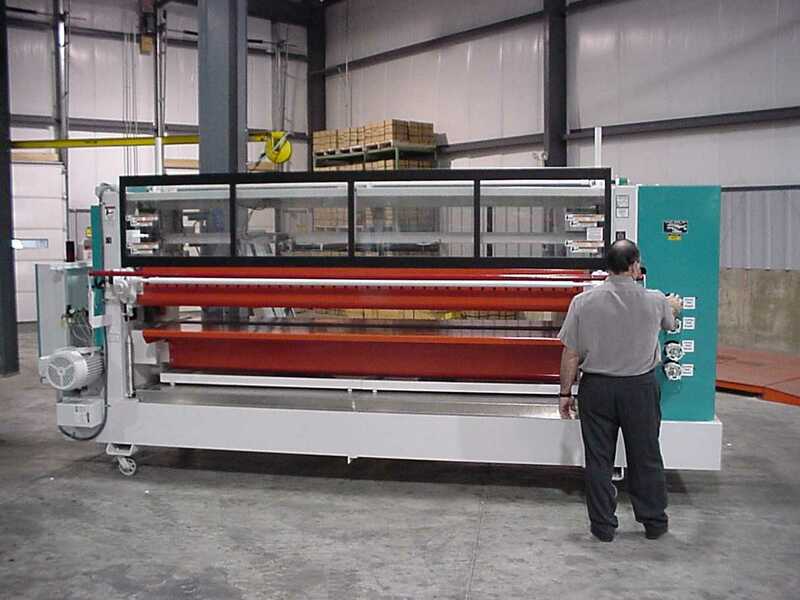 The C1175 can have all the options of the 775 hot melt roll coater. The addition of an independent variable speed on the doctor roll may be added when low coating weights are needed with high viscosity PUR hot melt adhesives. Start-up assistance and training at your plant by a Black Bros. Field Service Representative can be arranged. Bulk melt or drum unloader units are also available. We can also make arrangements to connect the hot melt adhesive supply with our liquid level to provide an uninterrupted supply of hot melt adhesive. Known for accuracy and durability, the Black Bros. C-1175 Hot Melt Roll Coater is a superior machine that will deliver predictable results for many years to come. Look to the makers of quality machinery for your next capital equipment purchase. Quality, durability, and unparalleled customer service is our promise to you!